Product #60793 | SKU 38201 | 0.0 (no ratings yet) Thanks for your rating! The Goal Zero Yeti 1000 Lithium Portable Power Station is designed to be the most versatile and innovative power station on the market. 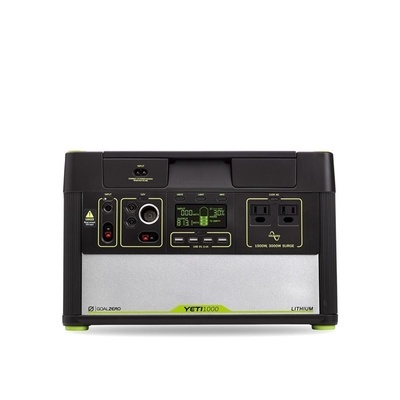 The Goal Zero Yeti 1000 features a patent-pending 1500W AC inverter designed to tackle any job, both indoors and out. The Goal Zero Yeti 1000 provides instant power at the push of a button, and features a silent and powerful 1045Wh, 96.8Ah (10.8V) lithium battery. It also features an informative display featuring a runtime/recharge time estimator, as well as a battery level monitor and an output/input meter. You can recharge from the sun by connecting a compatible solar panel. Charge time is dependent on the size of the solar panel. The Boulder 200 Briefcase will fully recharge the Yeti 1000 Lithium in about 10-20 hours. Power options: 4 USB ports, 2 AC outlets and 12V output. Charge time: Fully recharges in about 18 hours.